Welcome to Stranger Than Fiction, a series aimed at keeping you up to date on what’s happening in the Destiny-sphere. These aren’t your average, everyday stories, though. We’ve scoured the web, and seen things we can’t unsee, all in the name of bringing you the coolest, strangest, and funniest tidbits from the Destiny community. As the hype continues to feverishly build, we want take a moment to take step back and look at what some enthusiasts have been getting themselves into. Writing is hard work. As such, the life of an author is less wild parties, and more enjoying the moments we get to lose ourselves in musing about our favorite topics. That’s exactly what Reddit user PsycheDiver did by penning a 63,000 word story based in the Destiny universe. From the Frontier spans 51 chapters, and took PsycheDiver 15 months to complete. The story has 11 acts, and is a true example of commitment to art. Check it out, it’s well worth the read! Have you ever wondered what our surroundings would look like without the guns and carnage that is so often in our view? Several members of /r/DestinyTheGame have aimed to show us. /u/ImFlyingToaster posted these shots that show how breathtaking areas in the Cosmodrome and Lighthouse can be. /u/SlamWow and /u/HelenaHarper took some amazing screenshots while exploring The Ishtar Cliffs and Pantheon, respectively. All these are cool, right? But, you’re probably saying, “We’ve seen most of these areas thousands of times by now! Well, check out these cool stills taken /u/DJxyz20. DJ was required to breach the map to get most of these screenshots, but in doing so, was able to capture some pretty awesome shots of blue lava on Venus and the hanginging tombs on the Dreadnaught. Want to know how to take your own HUD-less screenshots? Learn how by checking out this tutorial. We’ve all been there. That moment when you know it’s your time to shine. You call out to your teammates, “I got this! My super is up!” Then in a moment of fear, panic, and regret, you Fist of Havor the poor tree that was minding it’s own business, only to be mowed down seconds later by your opponent’s primary. With the Spring update upon us, it’s nice to take a look back at how far we have come in our fight against the evil minions of the Universe. Youtuber Bearer of Light posted a video that allows us relive our greatest conquests. If you’ve forgotten how epic it was when we fought back against the Vex in the Black Garden, or how it felt to slay the Son of Oryx for the first time, let Bearer of Light’s video serve as a reminder. It’s hard not to feel nostalgic about our experiences in Destiny while watching the video, but Becoming Legend serves as reminder that no matter what challenges we’re faced with in the new update, we will defeat them. And, will probably do so with while playing blindfolded with a Rock Band instrument as our controller. Many guardians got their start slaying aliens in the Halo series. While Destiny is home, Halo provided some truly memorable experiences. If you haven’t had a chance to try any of the Halo titles out, perhaps you should let /u/MiracleMadMax’s daughter sell you on it. 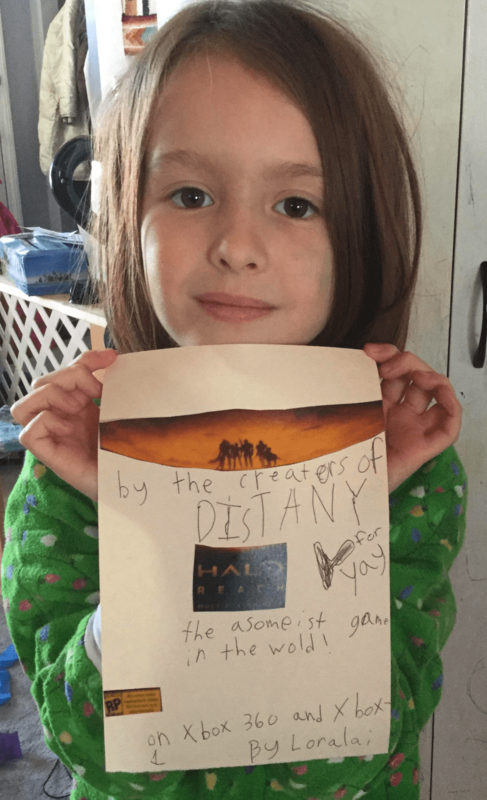 While we’ll agree with 8 year-old Loralai that Halo: Reach is awesome, Destiny might hold the title for “Asomeist game in the world!” Maybe we’ll have to revisit our pals with the UNSC while we wait April Update. Lastly, we would like to leave you with a music video by youtuber UnknownPhyzics. The video, part of a series of Gun Sync videos UnknownPhyzics makes, is an oddly satisfying montage of our favorite weapons being fired perfectly in sync with a great song. More importantly, it raises the question, if a Hunter throws a knife into the horizon, will there be a any one there to stick it with a Trip Mine or Lightning Grenade? Are you a crazy completionist, a creative genius, or just enjoy doing odd things instead of mindlessly murdering aliens? We want to hear about it! Tweet, email, or leave the tale of your feats in the comments below and you just might be in the spotlight on our next Stranger Than Fiction!